Have you read the book Wemberly Worried ? Worry, worry, worry. Too much worry. Being anxious or nervous is not bad or wrong. It’s just another feeling in the great land of emotions! I tell Natalie that the physical feelings of being nervous (tummy butterflies, dry throat, sweating, feeling flushed) are her body’s ways of protecting her. We talk about her body “checking-in” with her brain – Are you sure this is safe? Most of the time, the answer, of course, is yes! But, I never want her to disregard or ignore those feelings. She should always pay attention to her “gut” feeling. If I know in advance about a schedule change, a substitute teacher, etc., I always try to give my girls a heads-up. They like to know if the party we’re going to is going to have a lot of people they don’t know. They like to be reminded that it is going to get very dark at the theater before the play starts. I cannot predict every possible thing that might cause some worry, but I can try to be aware and attentive. Now that my girls are older, I also encourage them to ask questions that will help make them feel more comfortable going into a situation. Knowing what to expect can be a helpful tool in soothing an anxious child. When Natalie goes to ballet, she likes to know where I will be while she is in class and where I will be standing to greet her when she comes out. On the way to ballet, we talk about what she might do in her class that day – the beginning stretches, the positions, the fun free time at the end. Talking through an activity in detail can be very reassuring, and it can also distract your child from thinking about the butterflies in her tummy! Natalie is probably sick of me asking her, “What are you telling yourself right now?” But, I think positive self-talk is such an important skill, especially for someone with anxiety. Back to ballet class….. I encourage Natalie to tell herself things like I know the teacher and the kids in my class. I always have a good time. I will see my mom in one hour. This will be fun! These are feelings she expresses to me after class, so I know they are something she identifies with and can use to redirect her thinking as she waits to go into class. Yes, my kids take about 20 minutes (or more!) to “warm-up” at a busy birthday party. It’s okay. Yes, we arrive at classes and appointments early, so we can have a chance to check things out ahead of time. It’s okay. Yes, I stay at ballet class while all the other kids in the class are dropped-off. It’s really okay. Extra time to be ready, extra time to feel comfortable, extra time to process – so important and so powerful! Help your child discover calming techniques. We went to the dentist recently and as we sat in the waiting room, Natalie was getting increasingly nervous about having her x-rays taken. We managed to make it through all four x-rays with some deep breaths (and silly jokes – laughing is a good stress-reliever!). After our appointment, I made sure to tell Natalie this: “Even though you were nervous, you were able to stay calm and persevere through getting your x-rays. You should be so proud of yourself.” And she was! These are some ideas that have worked for our family. If you are concerned about your child’s anxiety, please talk with your pediatrician. Do you have a child that struggles with worry and anxiety? What are your go-to techniques for calming your child’s nerves? We’re Ready for Valentine’s Day! This is great. I have a worrier too. My oldest is a bit nervous about things. Its not everything, but certain things I can tell he has issues with. He doesn’t voice alot of them. Thanks for writing this. Great tips. Thank you for this – I have an anxious child and am so not that way so it’s been hard to slow down and realize what makes her calm and collected is so different than what I naturally do. These tips will help me to continue to give her the ability to address it herself. That’s a neat photo. I think it tells a story all on its own. I have read Wemberly Worried. I’m such a Kevin Henkes fan. I don’t have an anxious child, but if I did, this post would be invaluable. Thanks so much for writing this great post. I have a worrier (my oldest son) and am married to a worrier. I LOVE the book, What To Do When You Worry Too Much! I bought it when my oldest was in kindergarten (he is now in 2nd grade) and I still refer to the concepts in it really often when his worries crop up. Thanks again for a great post! I’m so glad to hear you found that book helpful – I just ordered it for us! i have a worrier, too! this is a great post! a book that i found helpful was called child sense. it explained a lot for me about why my daughter does the things she does and how to deal with it! oh, this is so familiar. this was me as a child…and i see it in my own kids. thank you. this is the boost i need. too often i push myself away from patience as i help my kids. Thanks for sharing. I have a sensitive, very slow to warm up, slow to try new things, child. Sometimes it is very hard. I feel judgement sometimes. It’s hard when you feel people think you are just supposed to “throw them out there” as if allowing warm up and different strategies has casued the “problem.” Sometimes I want to cry when I see other kids have a blast and let go so easily… like at preschool parties, a dance class that she won’t participate in, or not even wanting to blow out her birthday candles in front of everyone, is still 4 and gets all wierd about doing no. 2 in the potty and still doesn’t do it regulary! I have to tell myslelf, that she will be OKAY. Remind myself of how much I love her, how grateful I am for her, what a joy she is and how blessed I am just to have a healthy child. Amy~ You are wonderful. Just what I needed to read today! My oldest struggles with anxiety, and some phobias. I am fairly patient with her, and some friends and family think I am making it worse by doing so. Thanks for the validation. Perhaps I will share this post with some of those who feel it necessary to comment to me! getting ready to go to ballet class right now. I’m glad to have found this post before we head out–early. :) My daughter has been having trouble for the last few weeks in class because they’ve started talking about the recital and she’s feeling anxious, even though it isn’t until June; so she’s been crying when I go to leave the room and can’t get herself under control even if I stay with her. we’ll see how today goes, but I might check out some of the book recomendations when we get back. I do feel bad for her and wish she could have fun. I see her get upset with herself for being afraid–it’s hard to watch and hard to help sometimes. thanks for the post. Very interesting post. We have a very anxious child, to the point that she has been seeing a counselor for a year now. Sadly her main anxiety is death which is hard enough to encompass as an adult, let alone as a 6 year old. I have a worrier as well… well two, but one much more than the other. These a great tips, positive but proactive… perfect! As a mum also I read your post and thought “great post and well written”. However reading the post esp the part about having to stay at ballet class made me have a niggling feeling. I couldn’t help but think to what extent is your child somehow picking up your anxiousness about the situation and feeding on it? Its a chicken and egg problem. A child picks up a parents anxiousness and then feels there is something to be anxious about and the parent picks up from this and so on and on it goes. Id suggest that as your daughter is now 7 years old she is old enough to be dropped off at ballet and not have you stay. A move to more independence in the end it can only do her good and elevate her self esteem. Perhaps saying “I’m just popping out for 15mins to make a call” (time it and make sure its exactly 15mins don’t be late). Next time say “I’m just popping out for 1/2hr to go to the shops” then work it up until you leave her for the entire class. Gradually your daughter will learn that her world does not cave in when you leave. What a fantastic post. I will definitely check out those books. My daughter and son both show signs of anxiety and I was struggling to deal with it. I ended up buying the book “The Highly Sensitive Child” by by Elaine N. Aron (http://www.hsperson.com/pages/child.htm) and it has been a life saver. It talks you through a variety of techniques to help children adjust to new and old situations. It also breaks down into age groups which is really helpful. The best part of the book was the chapter for teacher which I have given both my daughter’s and son’s school and kindy teachers. It has helped them understand anxiety/sensitivity issues so much more and both children are much more settled at school/kindy as a result. 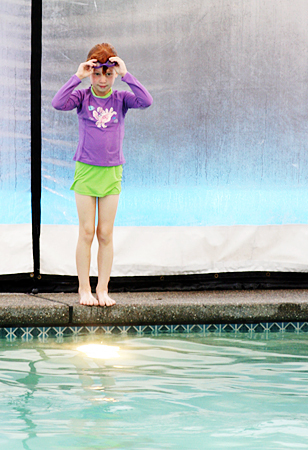 Our oldest has sensory integration issues that lead to anxiety in unknown situations. We had great success with occupational therapy and therapeutic listening techniques when he was 3 and 4. We have had to revisit the therapeutic listening again now that he is 8 to help address some new issues, and it seems to be helping. Apparently, as he hits new milestones, we will have to address the sensory issues again in new ways. I have been so amazed at the things that are being done in pediatric occupational therapy for these kiddos to make their lives a little easier. Rachel & Sally: Thanks for the book recommendation for The Highly Sensitive Child – I will be checking that one out! Thanks, Amy — I was just researching anxiety with kids as something big popped up with us the last couple weeks and it’s now determined to be anxiety. Gosh, I had no idea! It affects her eating and she was losing weight. Happy to get these resources from you, someone I trust with solid information. I knew there had to be better ways to deal than using a psychologist. Of course, if it gets worse that would be fine. I can’t wait to try out your ideas here. Thanks!!! I am from turkey. I have been in here 8 years .Thanks for sharing. I have 6 years old daughter. I assume she has anxiety problem since last year. Sometimes she doesn’t want to go to school. Says i don’t feel good. And last week in the car with her father (i wasn’t in the car by the time)she told her father i feel like i am gonna die and cried. When i got in the car she felt better. When we go somewhere sometimes she feels anxiety. I don’t know what to do. i got anxiety before one week my due date. Do you thing that effects the baby inside you ? I have that problem and 2 times depression last 3 years ago. I am so worried for my daugter. can someone give me some advise please, Thanks. I have been dealing with untreated anxiety my entire life. I am 41 now! As a child my mother did not understand my feelings as she manages not to worry about anything. She has always referred to me as a worry wart. Her intentions were well meant although she never offered me comfort but instead thought she could help me by brushing my feelings off and telling me not worry about things that I can’t change. I have a 10 year old who has suffered from anxiety since the age of 2. According to my family and friends, this is totally my fault. I make a very conscious effort not to express any anxiety around her yet she still worries about some of the same things I worried about as a child. My husband thinks I baby her too much with out allowing her to face her fears. Usually when she is feeling nervous a simple hug and me telling her that I understand why she would feel that way helps. Sometimes she just needs reassurance from me that everything is going to work out. Thank you for this post and reassuring me that “it’s okay”. I’m so glad you found some reassurance in this post and I thank you for sharing your story. Like you, I do not think my parenting created my daughter’s worries and anxieties. I do my best to honor who she is, while helping her develop tools and skills to be successful. Keep on hugging your girl! My son is nearly 6 and has really fluctuating anxiety issues. He sees a paediatric psychologist and I do everything she says, but the problem is I only have him 1/2 time (week-about) with my crazy ex who refuses to do anything to relieve his anxiety like adhere to a schedule etc. so I feel like all my good work is undone on the “off week”. I’m trying to fight for more time with him – changing to a 10/4 arrangement during school terms so that he will have more stability but my ex is refusing despite the psych recommending it. Are there any books or anything extra I can do? I am doing all the stuff you recommend already, but am getting desperate!!! My daughter is 9 years old and she has separation annixity we are seeing a hypnotist twice now.The problem is that I e been in her class for 14 days in her class room as she so t let me go to work.Im in desperate need of help as I would like to return to work.My Daughter comes first but I want her to get better we miss our Little Girl can anyone help please!!! I have one son who is of the worry driven anxiety type. My older son seems to have developed anxiety as a result of a series of unfortunate incidents. The anxiety has been debilitating, and he has missed most of the school year. The parenting piece has been quite overwhelming. I’m sixty-seven, and still battling anxiety and OCD, though managing fairly well. I had a difficult time helping my daughter, who’s anxiety was made worse by dyslexia, and now my grand-daughter age nine has suddenly become very upset. It’s pretty obvious that the condition is genetic, and it’s difficult to prevent oneself over-identifying with one’s child and feeling almost worse than they do. I sought help from a Family Psychologist when things got serious, and they had to help me to calm down too! I was relieved when they told me that pushing an anxious child in at the deep end and letting them sink or swim isn’t the answer, in spite of needing to let them know that their fears aren’t all justified. I know this is an old post, BUT….As I was reading this, I found myself reading things I tell people all the time. When I take my 9 year old to dance class (which she has been taking since she was 3), I have to tell her where I will be and I have to be in that spot when she checks on me. I am one of the only parents who sit and wait for her while most of the other kids get dropped off. I also have to be proactive whenever possible because change totally overwhelms my daughter. It made me feel less lonely reading your post. Thanks! Yes, feeling less alone makes a huge difference….it seems like with the numbers of anxiety for kids, we wouldn’t feel so alone or judged! Glad I found this post, and the comments.